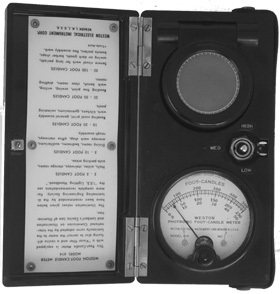 This appears to be an industrial meter. There's a big sensor and a meter and a simple scale switch, and that's it. The instructions are on the inside cover (upside down), and all it says is that it conforms to industry standards and tells what illumination levels (in foot candles) are typical for different places (such as a home, an office, a barber shop, and so on). I believe it was used to check the ambient light levels in factories. You just open the cover, set it on the work surface, switch the proper light range, and read the scale. Very, very similar to my Wollensak Fastax except that the foot candle range is much more reasonable. A company called Huygen claims to have made at least some of these, though their 614 looks newer than mine. Weston got out the commercial light meter business in the 60s when they were bought by Daystrom, so I suspect they probably started up with Huygen at that point. Tough to say when this was made. I opened up the back of the unit and someone lightly scribed 3-8-34 on it, so I'm dating this as 1934.